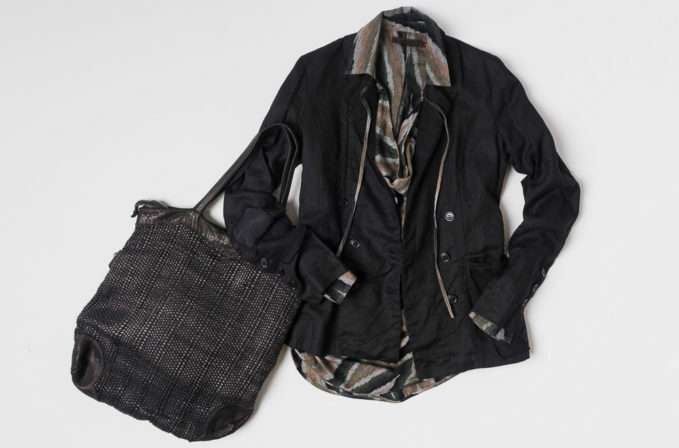 Casual and rustic with an edgy and urban cool is the combination of Nicholas K and Greg Lauren. An ikat print in grey and green has an asymmetrical drop hem that can be tied with drape and different form. Greg Lauren clothing often is created from reworked vintage fabrics into unique and handmade garments in his artistic vision. The Greg Lauren tailored black patchwork linen/silk jacket layers well over the Nicholas K ikat print shirt. The black and grey outfit works with a Vive La Difference black leather handbag.